Are you looking for an awesome or beautiful garden gifts? Explore our handpicked and independently chosen gifts for both garden lovers and green-fingered gardeners. We’ve trawled the web and found what we think are the best garden gifts you can buy. All of the awesome garden-themed gifts listed below have been chosen by the people behind Gifted Geek. The team here at Gifted Geek just loved this little gadget! 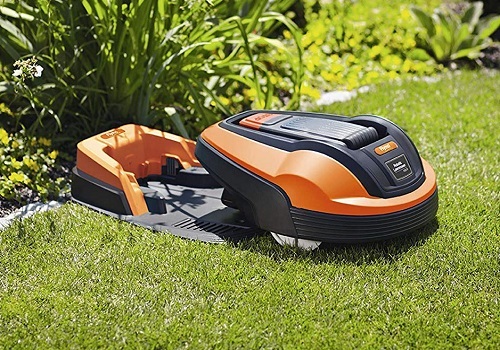 The Flymo Robot Lawnmower is 100% automated and will cut your grass to the desired height effortlessly, when the battery is running low, it will even make its way back to the charging station to recharge. Say goodbye to hours and hours cutting grass, let this robot do it for you! We think this is one of the best geeky garden gifts out there. 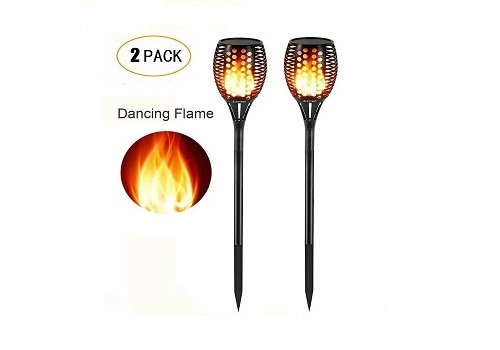 Let these solar-powered garden lights shine in your garden, no wires, easy to install and they flicker or “dance” to create a life-like flame effect. These waterproof lights would make a perfect decorative feature around pathways, patios, driveways or pools. Turn your garden into a paradise with these solar flickering lights. Beautify your garden with what we think is one the best garden gifts. The hedgehog population is in decline due to urbanisation but you can do your bit to help these spiky creatures by installing one of these hedgehog homes in your garden. 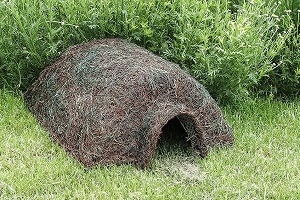 This domed hut provides protection and the kit also includes some hedgehog food and a guidebook. This would make a perfect gift for an animal-loving gardener. This is a top quality solid brass metal door sign that exudes style and personality to all visitors. The wording of the sign is ‘Dad’s Shed’ and is just the right size to send a clear yet polite message. The sign is 12.5cm by 3cm and has been hand polished and coated in a protective lacquer to preserve the brass and prevent tarnishing. A great gift for garden-loving dads. Do you know someone who spends hours and hours tending to their garden? They probably bring more mud and dirt into the home then they would like, so help them out with this simple but practical gift – a personalisable door mat! Create up to three lines of text with a max of twelve words per line and impress your gift recipient. This sundial is cast from genuine English sand brass, that is high in copper, and has been coated in lacquer to sustain its fine finish. The product is customisable with any text you would like to choose up to 80 characters. 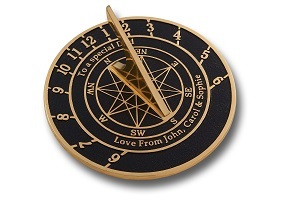 This well made, solid, personalisable sundial is a unique product that makes a perfect gift that cannot be found elsewhere. 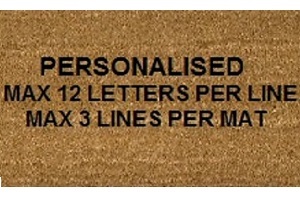 Here at Gifted Geek, we love personalised gifts as they add an extra touch of uniqueness that we feel makes a real difference. This wooden crate and planter is ideal for growing plants, fruits and vegetables in the garden. 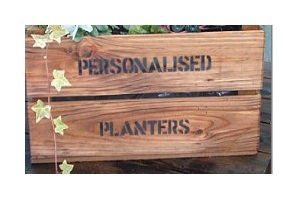 You can even personalise the front of the wooden crate with a personal message for the gift recipient. 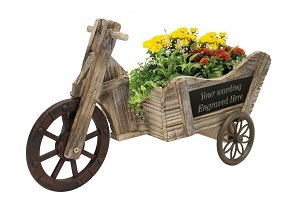 This hand finished wooden tricycle planter makes a great gift for all keen gardeners to display a lovely bouquet of flowers either indoors or outdoors. The wheels are moveable which makes it easy to shift around the property and the plaque on the side of the tricycle can be personalised with 4 lines of up to 20 characters each. 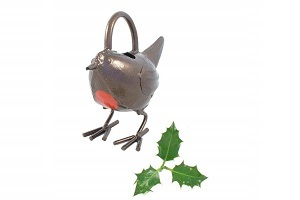 This charming Robin Watering Can would make a cute addition to any home and brighten up the garden with its presence. 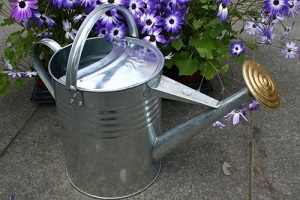 This galvanised metal watering can hold around half a litre of water and measures approximately 26.5cm x 10cm x 24cm and is perfect for adults or children to use. The colours of the watering can have been modelled after the red-breasted robin seen in the wild. This quirky garden gift is an adult sized apron which is perfect for any gardener and is brought to us by printmaker Rachel Bright. 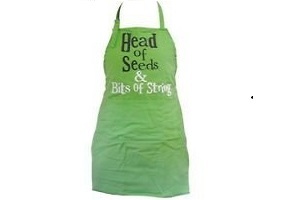 The apron is green to match the outdoors and is printed with the message ‘Head of seeds & bits of string’ and is sturdy enough to be machine washable. There is a large front pocket for holding garden accessories and an adjustable neck strap for comfort. 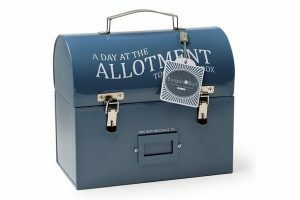 This unique gift contains everything the keen gardener needs to grow five unusual vegetables – purple carrots, stripy tomatoes, red brussels sprouts, multicoloured Swiss chard, and yellow courgettes. 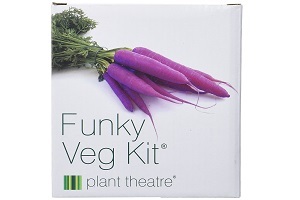 The kit also contains five growing pots for each vegetable complete with peat blocks and tips for sowing and growing. All of the seeds in this kit come from the UK. 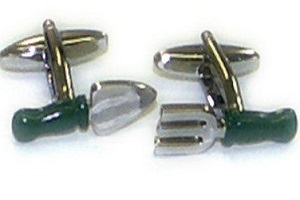 This pair of cufflinks makes a fun gift for the green-fingered of the family. The set includes one trowel and one fork coloured a shiny silver and green colour and finished to an exceptionally high standard. They are a suitable gift idea for any occasion – Christmas, Birthdays, Weddings, or any other. The cufflinks come with a gift pouch which they can be stored in. 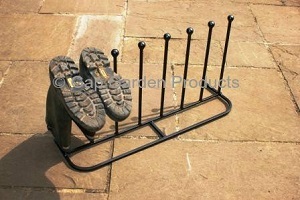 This is a functional and stylish boot rack that can store 4 pairs of boots from riding boots to wellies. This is a top quality British designed and made rack which is crafted from solid steel that has been coated in black antique paint which is extremely durable and long-lasting. The size of the rack is 86.3cm Long, 26.5cm deep, and 48.3cm high. A perfect present for any green-fingered friends or relatives you may have. These markers can be used to label fruits, vegetables and other plants in and around the garden. 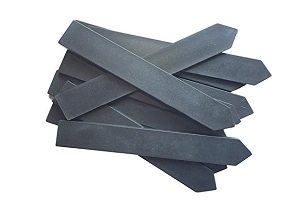 Made from natural slate, just use chalk to label them and don’t forget; you can use these eco-friendly non-plastic markers again and again. 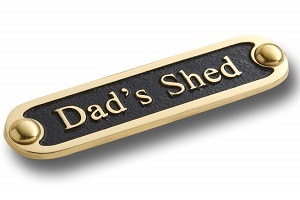 This product is perfect for a gift or as an additional tool to your own garden shed. Burgon & Ball have been making top quality steel products since 1730 in Sheffield and this seed & stuff tin is no exception. It is an excellent metal storage tin that holds seeds or other things with a top that flips open for easy access to its contents. This tough plastic tool rack is perfect for space-saving and better organisation of tools in the garage or workshop. 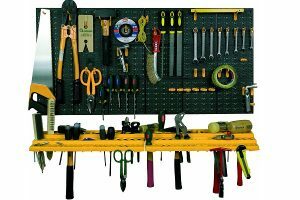 The rack is made up of two pegwall panels, 50 assorted hooks, and a tool shelf for plenty of storage options. The dimensions of the rack are 1000mm wide x 500mm high and have holes for fixing to the wall though fixings are not included. 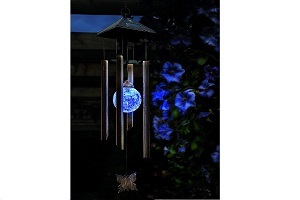 This solar-powered wind chime combines lighting effects and also a beautiful sound. 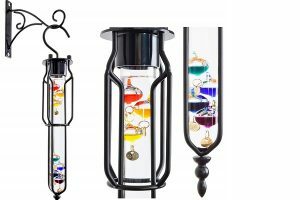 This chime is made from four metal tubes and a coloured glass striker. LED lights inside the glass striker gently change colour as the ball impacts the metal tubes. No wiring is needed as this chime is solar-powered. 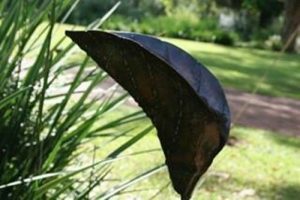 These handsome garden sculptures are made by artisans from Zimbabwe and liven up any pot or garden. They are crafted from recycled oil drums and metal which is heated, shaped and polished to last for years. These are Fair Trade products which help provide a decent standard of living for the makers as well as their families. Each sculpture is unique and around 90cm high. 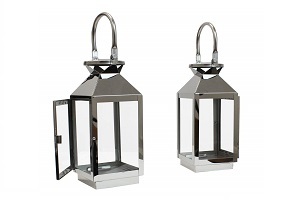 These candlelight lanterns would brighten up any garden. Windproof and constructed from metal and glass with a looped handle, they will fit onto any hook and can even be hung from branches, walls and fence panels. We think these would make a great garden gift and would look wonderful in any style of garden. 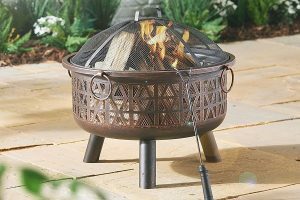 This eye-catching fire pit makes an excellent addition to any garden and is both practical, and with its detailing, is also aesthetically pleasing. This fire pit can burn both charcoal or logs to brighten up a night out in the garden, and its mesh guard will protect people from sparks. Easy assembly is required and this product is 64.5cm high x 66.5 deep. 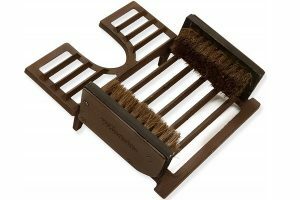 This sturdy scraper and brush is created by Woodside who are highly regarded suppliers of garden leisure products. Keep this product by the door to serve three purposes – boot brush, scraper and jack to remove dirty shoes and boots and help keep them clean. This weatherproof device is strongly built from cast iron and has a vintage, rustic feel to its design. 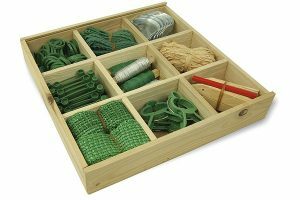 Another great product from Burgon & Ball is this strong and sturdy tuck and toolbox which can be used for a variety of purposes. Burgon & Ball have been crafting high-quality metal products for 280 years and this box is no exception. The perfect garden gift for storing all sorts of things including gardening tools, this is one box built to last years. This is a high-quality rain gauge that accurately measures rainfall through its funnel and its measure has been calibrated in inches and millimetres. This style of rain gauge is perfect for both professional and amateur meteorologists and rainfall is measured in the jar that accompanies it. 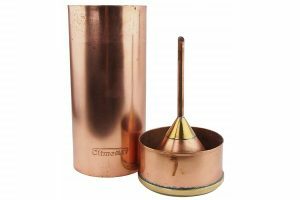 The gauge has been built to last from copper with a solid base that provides dependable stability. 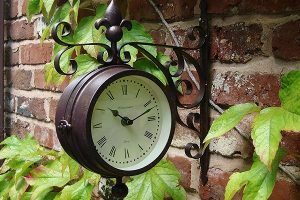 This chic outdoor garden clock will look stunning in any property and makes a great garden gift. The clock is double-sided and finished with an antique rust effect to give it a lived-in authentic look. The clock is battery-powered and also has a garden thermometer attached. 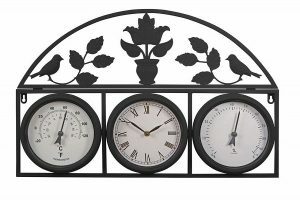 Great for your own home or as a gift, this clock adds a classic touch and is easy to hang. The team here at Gifted Geek loved this practical and attractive garden bird feeder that has several bowls, bread and seed holders. This would make a great gift for anyone who would like to see more wildlife in their garden. Lightweight and easy to set up, this would look perfect in any garden. This product offers a very unique way of telling the temperature based on the scientific discoveries of Galileo. The outside air changes the density of the liquid in the device which causes an appropriately coloured ball to rise and indicate what the temperature is. The thermometer is 57cm tall and is a visually eye-catching device that adds a novel touch to any garden. This 3 in 1 weather station allows owners to monitor the time, humidity, and temperature in Celsius and Fahrenheit. It is strongly built from steel that has been powder coated and comes in three colours – black, cream, or grey. It is weatherproof so it can be mounted both inside or outside and is styled with a pleasant bird and floral design. 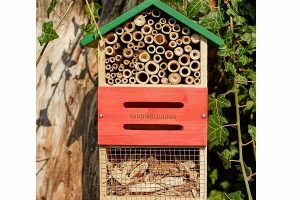 This Bug Hotel & Bee House is fantastic for attracting bees and benign bugs like ladybugs which are great for maintaining a vibrant garden. The house and hotel is constructed to be weather resistant and has a hanger that makes it easy to attach anywhere you like. Luring bees to promote pollination and ladybugs to help control pests is a breeze with this attractive wooden product. 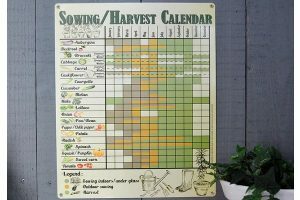 This charming metal calendar is perfect for keen vegetable growers. Crafted in a vintage style this calendar displays the sowing and harvesting times for a range of popular vegetables. Different colours are used to advise which are the best times for sowing outdoors, undercover, and when to harvest. The calendar is made from metal and can be screwed onto a wall. This handy wooden box contains an array of hard to find gardening essentials that are stored in neat compartments. There are nine spaces in total which hold a set of mixed rings, 40 flower link holders, 4 spools of binding wire, 6 spring-loaded plant clips, 20 wooden plant markers, 40 universal ties, a ball of raffia, 12 metal tool hooks, and 2 lengths of binding. These are premium ladies gardening gloves that feature genuine leather which makes them tough and durable while at the same time being very flexible and comfortable. 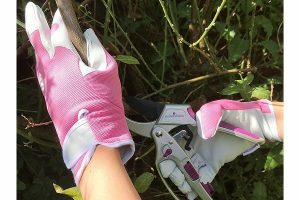 Perfect for all aspects of gardening and to protect hands against hazards such as thorns and other sharp objects. The gloves can be adjusted using the velcro fastener on the back for the perfect fit. This is a solid, no-nonsense, durable watering can that has been made from galvanised metal and brass. It has been designed in a traditional style and so well made it will last long into the future and would be a perfect gift for the practical gardener. It can hold 2 gallons (9 litres) of water, which is poured out through a metal rose spout. If you would like birdsong to liven up the garden this is the perfect way to entice them. 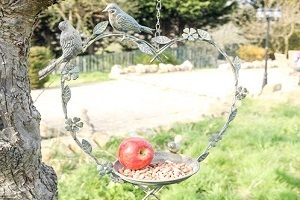 This lovely hanging bird feeder, shaped like a heart, comes with a chain and hook that can be hung anywhere to make your garden look and feel nicer. 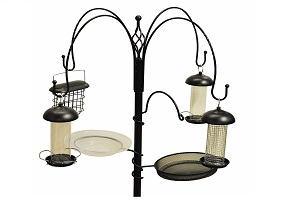 Made from sturdy powder-coated brass, this bird feeder is 33cm high x 32cm wide and suits keen gardeners or animal lovers. This is a stunning garden accessory that looks even better lit up at night. 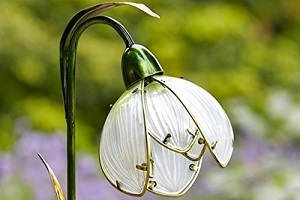 Powered by the sun’s rays, this glass petalled flower hangs like a snowdrop and switches on automatically at night to light the garden or back patio. A full charge will illuminate the 3 LED’s for eight hours and it also looks amazing by day. The flower is 87cm high x 20.5cm wide. 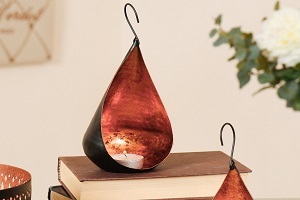 These curious metal and copper leaf tea light holders can be used all over the home both indoors and out. The make a great gift whatever the occasion and add a warm French vibe to the atmosphere. These versatile handcrafted items can be hung anywhere and their dimensions are S: H10.5 x W6.5 x D6.5cm L: H15.5 x W9.5 x D9.5cm. Did You Like Our List of Garden Gifts? 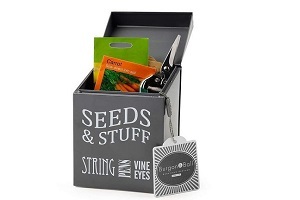 The team here at Gifted Geek really enjoyed sourcing these garden gift ideas. With so many presents to choose from, we don’t think you’ll have any problems making your friends, family members or work colleagues smile. If you have a suggestion, perhaps an awesome garden gift that we’ve missed from our list, contact us here.